My bag won’t ever fit under the seat after all the prime overhead space is taken! My mobile phone is tiny but the battery is huge! We’d like to continue boarding at this time, now boarding group C, numbers 31-60. Doomed to a middle seat. Doomed to a middle seat for sure! 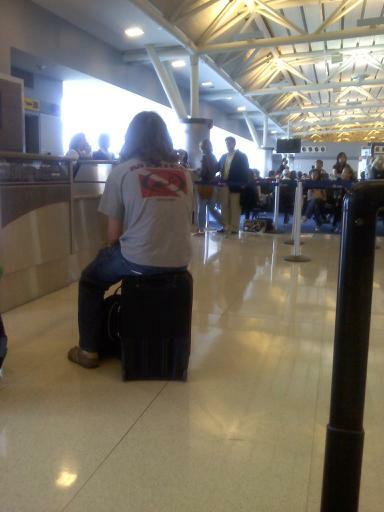 While great for storage, the Suitcase Leg has yet to take off as a prosthetic. I’m in the penalty box or why I shouldn’t have jokingly ordered the Filet Mignon, medium rare, when asked what I wanted on that RJ from CLE to DAY. Im sorry sir, we have a weight and balance issue with plane. We dont belive we will have room for you and your ego on this flight. When does that Wii go on sale again? I’m the first in line, right?!? !